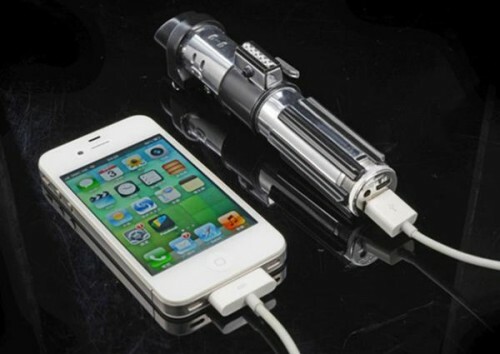 Is there anyone out there who did not, at some point, really, really want a lightsaber? That was a rhetorical question, because even if you claim you didn’t I won’t believe you. The real question is, did you grow out of it? Well, again…pretty rhetorical. Because of course you didn’t. Lightsabers are a class of cool all their own, and you can’t convince me you don’t want one. You can buy one. Right now. I am not making this up. It’s only about 50 bucks (USD). I’m serious. OK, fine…it’s a gadget charger and not something with which you can do battle. But it’s a licensed product, and modeled after Darth Vader’s lightsaber, and it’s really very cool (although admittedly not as cool as if it were really a lightsaber). It has a 2800 mAh battery capacity, and is completely portable for all of your charging on the go needs. It measures 16.0 x 4.2 x 3.1 cm and is compatible with iPhone, Android and Windows Mobile phones. Its input is a microUSB, and its output is a regular USB (1.2A), and unlike a lot of chargers, it’s all one piece (well, the charging cable is separate, but that’s it). It even has red LED lights mounted to simulate the blade, as well as LED lights in the handle to show its current power status. You need one. You know you do. And it really does only cost about $50.00 US.